♥elycia: hello there! any questions? Since the wedding and honeymoon (thank you for all your super sweet comments on the photos!) I have been feeling a smidge behind in the blog world. I noticed quite a few new faces showing up in the comments while I was away and I thought maybe now would be a good time for a little bit of Q & A as well as an opportunity to get to know any new readers. So, if you are new around here (or just feel like saying hello) and would like to introduce yourself or ask me a question now is the time! In the comments you can ask me anything you might be wondering (as long as it is appropriate of course, haha) and/or say hello and tell me something about yourself! ps. you can always learn a bit more about me by checking out my about me page (which i need to update! eeks!) and my new reader page! Hey Elycia, I'm Lorna from www.projectlorna.com and I'm a long time fan. You emailed me back about letting me use your pi video and I felt like I'd met a celebrity! Is there a colour you've wanted for your hair but never gotten around to trying? I wouldn't say I'm a new reader but just wanted to say HI! :) I've been reading Kaylah's blog for over a year and that's how I found loveelycia! I've been a reader for probably about 6 months & I love your blog! Lorna! you are so sweet. Yes I remember that! Good question, I will answer that in the Q&A post for sure!! Sarah, isn't kaylah awesome! her blog is so great. i'm glad you found your way here. i will check out your blog right now! I Elycia! My name's Megan and I've been following your wonderful blog for a little while now (I'm also from Ontario! woo). As for my question, I was just curious if you have made any new art lately? Your adorable banner is what attracted me to your blog and since then I've been hooked! I really love your drawings. They have such charm! Also, congratulations on your wedding! You looked absolutely fabulous! Hey Elycia! I left a comment a couple of days ago saying I'm new. Thanks for replying :) You've become one of my daily reads as of recent. I have a couple of random questions, sorry if this is too long! 1. You recently hung out with Kaylah a while back. Have you met other bloggers in real life? 2. What's the most difficult thing about owning your own business? 3. How did you get such a cute light color for your hair?! 4. Where do you normally find inspiration? 5. What's your favorite thing about having a blog? 6. What's been your favorite project/ DIY? Least favorite? 7. Did you look anywhere to find inspiration for your wedding? Hi elycia! I just happened upon your blog not too long ago and have been loving it! I'm still very new at blogging and am curious about how you got into it and what steps you took to making your beautiful blog what it is now. Please do come visit me sometime at FUN. Hi Elycia! I'm new to this blogging world- just started my own blog 3 months ago and loving it! I'm also wondering the same thing as Courtney- how do you make your blog as awesome and successful? Thanks for leaving a comment on my blog a few days ago too! Hey Elycia! Jenna here from sewsavoirfairecreations.blogspot.com - I'm a relatively new follower and it's been so exciting being a part of your recent blogging journeys. PS - your fab new hair hue makes my eyes very happy and my hair very jealous! Im new to the blogging world and just started my own blog yay! But I just wanted to know about one key thing to know about the blogging world or just blogging in general. I love your blog and your wedding looked so adorale i loved your dress!! If you would mind looking at my blog and maybe h=giving me some tips that would be sooo great! hello! i am donna, from deer donna. been around a while now, but people are only just starting to notice me! i live in melbourne australia with my beautiful man christian and our two kitties, sailor jerry and falkor. we love tattoos, crafting and eating yummy thai food. i love your new pink hair, it's like fairy floss! i have a question for you!! where did you get your wedding dress from?! it's so lovely! Hey Elycia! 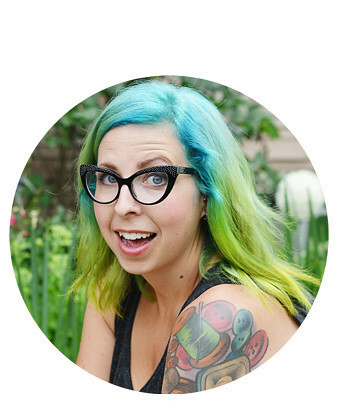 I'm Lauren, and I've been reading your blog for months now, I just get a little shy about commenting on things. I'm not sure why, cause once I start I'll never stop. (: I have a blog that I love dearly called Ivory Giraffes, and as of right now my sister and I are doing a Giveaway. I'd be so stoked if you wanted to give it a looksie. My question for you is what's your natural hair color, and when did you start dying it? Was it a hard decision to start dying it, or did you not even think about it? For the record, I'm in love with your blog and I think you're just the bees knees. Hey! I'm a new reader here and loving what you have to share and say. Hmmm...I guess for a question I'm wondering what do you think is one of the most unique attributes of each of your furry felines? Are you and ivan planning on having kids? Hi Elycia! I have been folowwing your blog for awhile, but have never thought to introduce myself! My name is Elisha (pronounced the same way). I enjoy reading blogs, mermaid, watching movies and eating applesauce. I am from Baltimore, MD but I have lived in Athens, OH as well as Greensboro, NC and now I will be moving to the Miami area in August! I am moving in with my boyfriend for the first time. How did you know when it was right to take the next step with your man? Hello hello! I like the cat question asked above. Hi Elycia, my name is Amanda and I am a new reader of your blog. I am fairly new at the whole blogging thing and I am trying to write in mine every day now. Do you have any tips for bloggers who are just getting started? Thanks! Just leaving some luvvv I LOVE your new hair you look so pretty! I'm a relatively new reader... Through dainty squid! I live in the toronto area and am curious about what are some things to do in Hamilton? My bf and I are always up for random road trips and Hamilton is always mentioned between us... Or can you recommend any other cool cities to visit in the Ontario area that you love? My best friend and I currently have a blog called walkingtaxi.blogspot.com. We do walks around Toronto ... And rate them... It's still under construction... But just putting it out in the blog world to see what comes out of it. Love your blog and keep up the good job! 2 thumbs up! I think you're blog is adorable and I'm wondering where you find all your cute vintage. Hello! I recently discovered your blog through Kaylah's blog. Both of you are really awesome by the way, and wonderful inspirations! Hi! I found your blog from Kaelah Bee & Kaylah. :) What bands or musicians are you into? Just started reading your blog and went thru the archives some to reread posts and I love your what i wore post! and your hair is super cute! do you color it yourself or have someone do it for you? Hi Elycia, your wedding photos are wonderful, you looked so beautiful. I was wondering what was your favourite part/thing about your wedding? It would be awesome if you did a post on tips for wedding planning and how you stayed unstressed during planning. Im newly engaged and am already stressig out! Theres just so much to organise. I have a blog myself, but unfortunately I write in Dutch ( curious? : http://www.irisanastasia.blogspot.com/ ). I love to wear vintage clothes, I like to be creative and cat's are my favorite pets ;) My boyfriend and I (we live together) are thinking about getting one in our home. I have a big tattoo (which will take a little more time to finish), dreadlocks, a few piercings. I have a passion for traveling around the world, photograph and scuba-diving. Well, that's enough about me ;) Great idea, to let followers introduce there selves. I checked your read-page a few days ago, I love this new version! I'm a new follower (well, I follow since May, more or less), and I really really adore your blog but I never comment because I feel a bit "boring" compared to you :). I'm Italian and I'm 31, and I really appreciate your hair color. I wish I'd be so brave to dye my hair, too, but I don't think my boss would appreciate... I don't know. That's all. It would be a pleasure for me if you would visit my blog (The Bunny Hole is about crafts, while Theallamenta is about nail polishes!). Hello! I'm Jamie and I've been following your blog for a couple months now. I can't remember exactly how I found you, but it was probably through Kaylah's blog. I just wanted to say how adorable I thought your wedding was. The colors are so so cute and I loved all the pictures. You looked beautiful! Hello, I recently following your blog. I'm a 23 year old Dutch blogger. A bride to be and just love books. I have a question! I have a question!! Which blue haired blogger are you super excited to see in just over a week?! Hi Elycia! I just starting follow about a month ago. I love your blog. You're adorable. I don't have any questions. But, keep up the blogging and I'll keep reading! :-) Have a nice Wednesday! also, i noticed that mentioned (somewhere) that you were in indie 2.0. me too! Hi! I'm Jana, and I live in Kansas City with my husband and two dogs. I'm a floral designer and full-time student (future nurse!). I adore your beautiful blog! Here's a question for you: If your life were a television show, what would the theme song be? I found your blog during the wedding guest posts. I have been hooked ever since then! You are just too cute and your wedding was so adorable. Hi Elycia! I read a few of the bloggers who were writing for you these past few weeks and I'm glad I followed them over here. First, I think your name is really beautiful! Love it! I'm Sara from Prairie Hen. We have corresponded a few times via ig and email but I couldn't resist the offer to say hi again. First I would like to say that I really admire how you are so genuine and goofy. It helps me be able to laugh at myself more. And your vlogs are my favorite. I am determined to do one one of these days... I just have to figure out a subject. Anyhoo- that's it! I am Marielle from magical day dream, I am a 22 year old student living in the Netherlands. I have been reading your blog for a little while now. I love drawing and making things. I only recently started blogging, and when Elsie showed some positive reactions on bloglove I decided to give it a go as well (although I am just making my first baby steps into the blog world). Your recommendation helped in doing that :) I guess one of my questions would be how do you go about guest blogging? I am a bit shy to ask and am not sure when it would be appropiate to ask such a thing, how well you should know someone, how to go about password log in practical stuff etc. I am wondering how you (as someone with more experience) started doing this. Just thought I'd say hi! I have had fun checking out your wedding guests! And your wedding pics! Hello! I've been reading your blog for a few months now ... I've been one of those lame readers who checks your blog everyday but comments rarely. Ha! I have to say, I LOVED your wedding pics. So adorable! My question for you is, did you guys write your own vows? Or did you reword anything to fit the two of you personally? Thanks for having such a sweet blog! I could've sworn I read this on your "about me" page a looong time ago, but I think you mentioned being an engineer before? hehe it's so cool to learn more about the technical backgrounds of bloggers who are also crafty. Anyway, just wanted to say hi again! Love your blog, been a fan for months now. Just wanted to say it was adorable to see all of the personal handmade touches you did for your wedding day, I know it made it that more special. Do you ever think about becoming a wedding designer? Your ideas are too cute! What do you do for a living and what is your typical day like? Let me just say that your video blogs are adorable...so genuine! I absolutely love your blog, and I've been reading it for about a year now,just after I started blogging myself. Though I really think this is the first time I've commented, I'm quite shy like that! My own blog is a bit of a mish-mash of everything, it has no niche of its own, but I enjoy it. Unfortunately, I usually use it to vent about how, now I've found the person I want to spend my life with, I've got limited time to share with my boyfriend. Keep up the good work, I must try this commenting thing more often, now that I know it doesn't bite! I'm Katie, I'm a cat lady who is I'm 24 and lives in the UK. I saw your blog on Kaylah's and was instantly hooked! (Mainly by your pink hair - it's fab!) I just started a new blog after using livejournal for over 2 years! If you get the chance, go and have a nosey round! I am La of Messy La, and I am a huge fan of your blog!